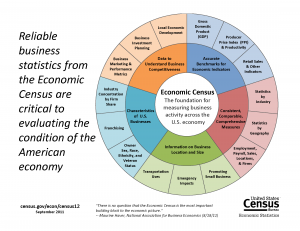 The Economic Census is conducted by the U.S. Census Bureau and measures our nation’s business and economy. This survey is sent to businesses with employees every 5 years, in years ending in “2” and “7”. Information available includes employer statistics for number of establishments (or companies), number of employees, payroll, and measures of output (sales, receipts and revenue). It includes geographies from the national down to the local levels such as economic places. However, some industries are not covered in this census as well as most government-owned establishments. There is also the Survey of Business Owners conducted during this same time which contains information on selected economic and demographic characteristics for businesses and business owners by gender, ethnicity, race, and veteran status.